My new “Moss Collection” was inspired from the Hummingbird who builds her nest, made of moss, in our backyard every February. Recently, her two tiny twin babies emerged from their pale blue shells and entered our world. Over the past couple of weeks I have been creating jewelry, made of moss, while watching the babies being fed and cared for by a very hard working mom. To see a hummingbird sit still is amazing, to watch one feed her babies is an honor. Thank you Mother Nature. 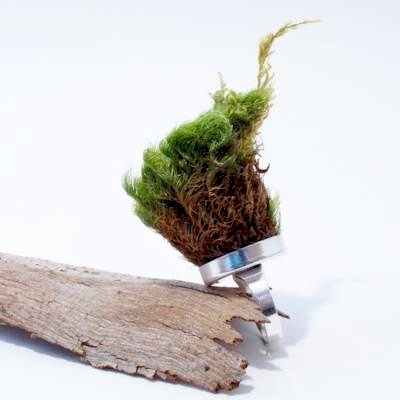 I’ve created an entire line of Moss Jewelry from earrings to bracelets to necklaces to rings. I usually haunted the hardware stores and now I’ll have to include the garden departments, too! Your backyard story added to the appeal of this jewelry.